The CPR and LEARN laboratories at the University of British Columbia are exceptionally proud to announce that Taylor Drury was selected as the University of British Columbia’s 2012-13 Governor General Gold Medal Award Medal Winner for graduating MSc students. This is the highest honour that a masters student at the University of British Columbia can receive. Words cannot express how proud we are of Taylor and the graduate students that assisted Taylor during his studies. Taylor has brought great honour to our program. We are all proud of his accomplishments and look forward to when he graduates from medical school. Taylor certainly will become a caring and passionate physician. It was an honour to have Taylor in our program. 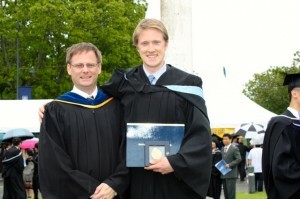 A heartfelt congratulations to Taylor Drury who completed his MSc thesis on July 9, 2012. We are extremely pleased to announce that Heather Foulds has recently (August 9, 2010) defended her MSc. Heather’s accomplishments during her MSc studies are remarkable with numerous peer-reviewed presentations, abstracts and published articles, and extensive external funding. She was able to complete her thesis is less than the allotted time, despite personally collecting data on over 700 participants. This involved a 13-week lab-based assessment of 106 participants, and a community-based physical activity intervention involving over 500 persons of Aboriginal descent. Her work simply is at the forefront of the field and we are extremely proud of her accomplishments. We are excited to have Heather remain in our laboratory for her PhD studies in the Faculty of Medicine. Congratulations Heather, you surely deserve every honour that you have received! We are pleased to announce that Mischa Harris has been awarded the prestigious CIHR Masters award. We are extremely proud of his accomplishments. We are pleased to announce that Katie Chapman (LEARN Laboratory) has been awarded the prestigious CIHR Masters scholarship. We are extremely proud of her accomplishments.